About the Author: Aseem Baruaole is an SAP Consultant with 15 years of SAP Implementation and 9 years of domain experience in sales, working with multiple clients in diverse industry domain. Aseem is working with Infosys as Principal Consultant (SAP S/4HANA Logistics) in SAP Transformation Center of Excellence. 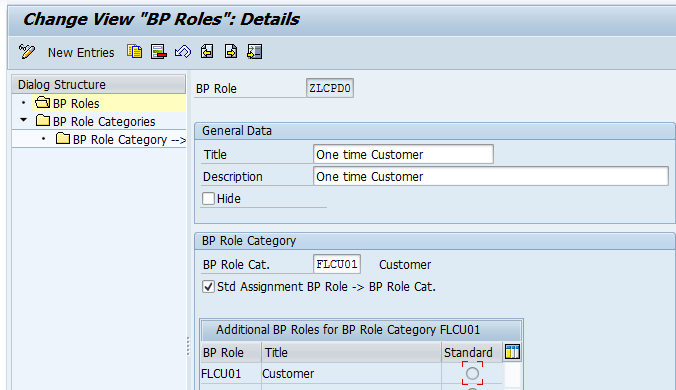 With SAP S/4HANA users always have questions how to create master for One Time BP -Customer/Vendor, as in standard BP role for one-time account is not available presently.While exploring the system for a client, I came across it, and though of sharing the solution through this blog. This document aims to explain concept and steps with screenshots to create One-Time Customer BP role. The same concept can be followed for creating One Time Vendor as well. Though with S/4HANA customer and vendor masters are created with Business Partner concept, but all the controls are still not there in Business Partner itself. 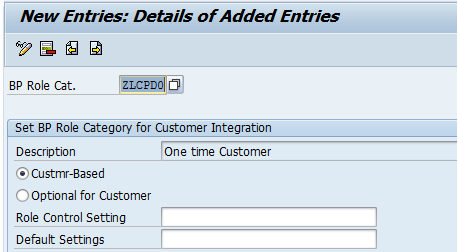 Whether a customer is one-time account(CPD) is defined while defining customer account group with transaction code OVT0, as we would do in SAP ECC. The control for one-time account is here, nowhere else you will find this control. Now in the following steps, we would see how the above setting in customer account group will integrate and influence a BP Role, so that system understands a particular BP role is One-time customer account and when a BP is created, it creates customer accordingly in Financial Accounting for the desired accounting entries after billing. Create a BP role for One-time customer. Can be created copying “FLCU01”, later adjusting settings for BP view and Field statuses, as per the requirement. 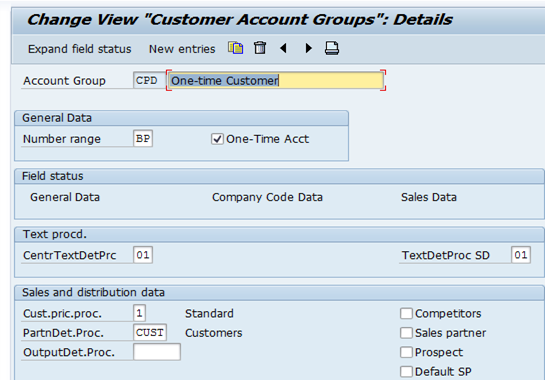 In next step define BP grouping for one-time account CPD, in IMG –>Cross Application Comp.–> SAP Business Partner–>Business Partner–> Basic Settings –> Number range and groupings –>Define groupings and assign number . Assign number range here for CPD. If both external and internal number ranges are required, we need to define two BP groups. In this step, BP role is integrated with customer. With this setting, system has to consider customer integration when it processes the corresponding BP role. For example in this case ZCLPD0, is considered as Customer. Here in this setting BP group is connected to Customer Account group CPD and system understands that this BP group is One-time customer account. In similar way One-time vendor account can also be created. Nice overview of the S4HANA customer creation. Thanks Aseem for your useful blog. When creating a one time Vendor, we are having an issue with BP Role Cat. If we use BBP000 for Create General we are not able to then create the Company Code views. But if we use FLVN01 you are required to enter an address and we do not want to do that for a One Time Vendor because we want to use the address off the invoice document. Do you know how to handle this problem?